3) The green Remington sabots have 25-30% higher tensile strength than any other previously released sabots. 4) Some previous attempts at using rifle primers in pistol brass have only been able to be reprimed properly a couple of times. This is due to the incorrect primer pocket depth when using parent pistol brass. Barnes Bullets reports up to 12 proper reprimes with the Remington rifle brass. Your mileage may vary and likely will. Remington says, "As far as repriming, it is recommended to reprime 5 times, but we have reprimed up to 10 times with absolutely no issues." 5) Remington testing of their Model 700 Ultimate against several other production muzzloaders, with 3 pellet 150 grain loads, the Remington averaged 1 inch tighter 100 yard groups. 6) The Remington Ultimate ignites Blackhorn 209 superbly well. The folks at Blackhorn 209 / Western Powders will be publishing Remington Ultimate Only loading information. 7) Spinjag now offers a drop-in replacement ramrod for the Remington Ultimate, that includes the patented, rotating Spinjag for more consistent bullet seating and better accuracy. Contact Gun Innovations, see http://www.spinjag.com/ . 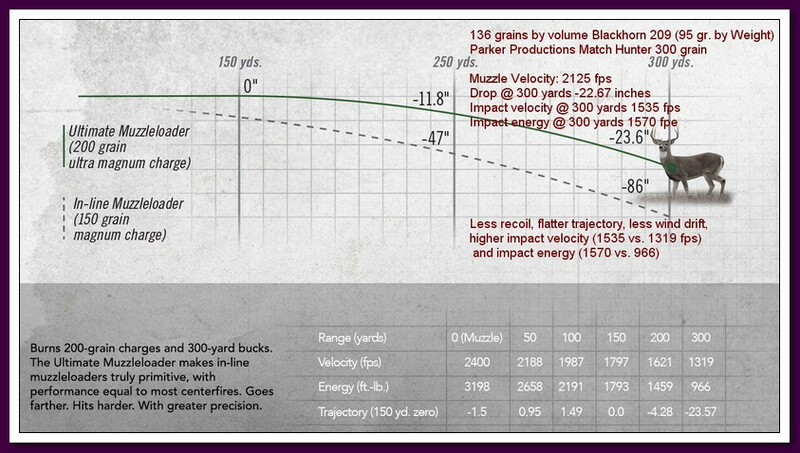 The above graphic shows why the moderate recoil load of 136 grains by volume of Blackhorn 209 (95 grains weight) combined with the 300 grain Parker Match Hunter is an outstanding long range load for the Remington Ultimate. See http://www.parkerproductionsinc.com/ .